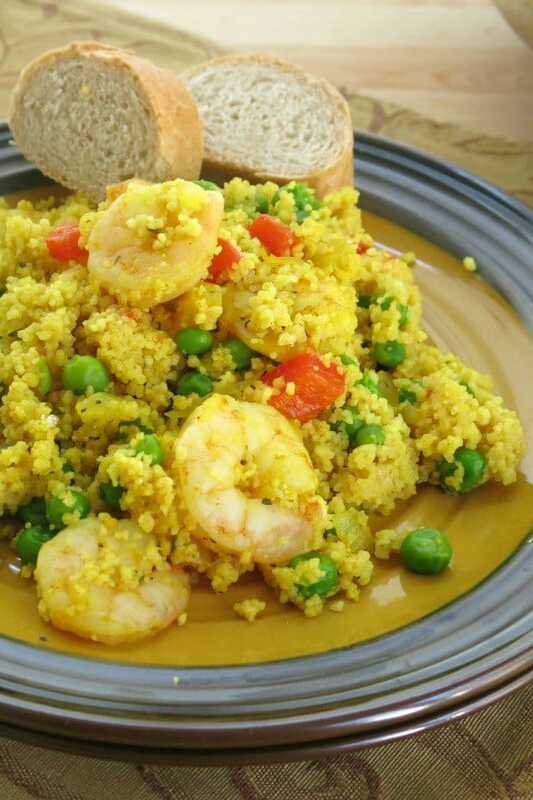 Shrimp Couscous Paella has lots of flavor, just like the traditional dish that originated in Spain. 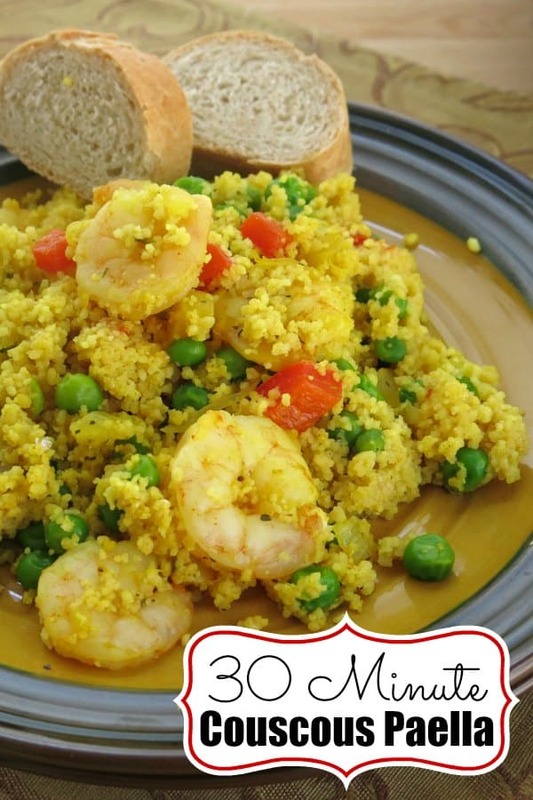 But, unlike the classic, this version cooks up in less than 15 minutes because it calls for couscous instead of rice! And, just like the classic version, it’s perfect for entertaining larger groups! All you need is a stack of bowls and forks and a little bread on the side. We love Easy Seafood Cioppino Stew for the same reason. 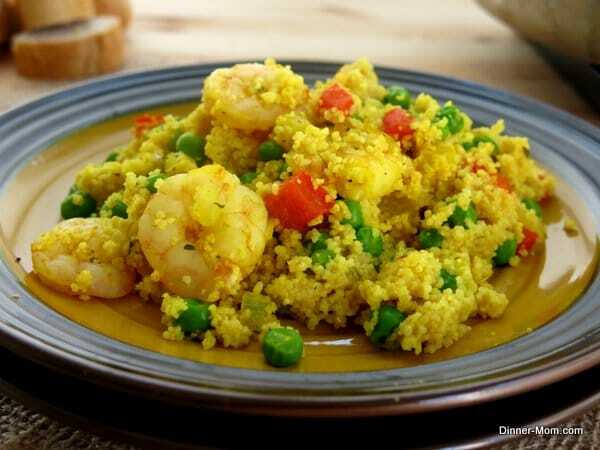 Couscous – Certainly the most controversial choice to replace rice! Traditional paellas, like Shrimp and Chorizo Paella, use bomba or Arborio rice. Note: We used Moroccan couscous which cooks very quickly and is easily found in the grocery store. 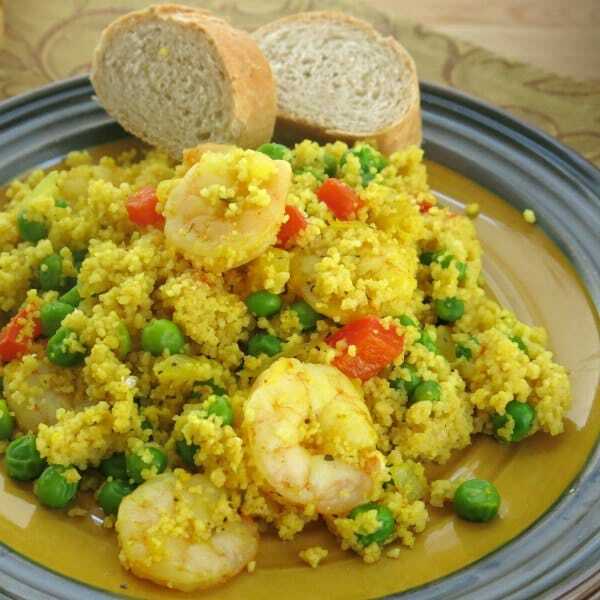 Couscous is made from semolina so it’s actually pasta, although it looks and has the texture of a very fine grain. Wow!!! Turmeric – gives this dish a yellow tint (and a bit of a kick too.) You’ll usually find saffron used to color the rice. It’s a little pricey, but may be worth it if you’re going for an authentic experience. Note: Turmeric is often used in Indian curries and is known for health benefits. However, you don’t have to use this spice to make this tasty dish. I’ve made it without this spice and it’s absolutely delicious! Shrimp – We singled out shrimp for this recipe because it cooks FAST! We like fast shrimp recipes! Note: Other proteins often used in paella include Spanish chorizo, beans or an array of seafood including mussels, scallops. Check out Easy Chicken Paella if that’s your protein of choice. 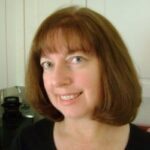 Really, anything goes! Vegetables – Onions, bell peppers, garlic and peas are commonly used in a traditional Paella dish. We used those. Note: Other vegetables, such as artichokes, green beans and tomatoes, are right on point too. I say add whatever you like so you have a complete meal! Red Pepper Flakes – are totally optional! This recipe doesn’t call for the hallmark “paella pan” either. But, it does use just one pan. Yep, just one pan. So, clean-up is a breeze! Use a large skillet, preferably with a 1 to 2 inch rim. You’ll need a lid or way to cover it as the couscous cooks. If you don’t have a lid, cover the pan with aluminum foil. Are you convinced that you need to make this for your next large gathering? If so, you will probably need to increase the recipe. Use a large pot instead of a skillet to handle the amount of liquid that is added. Carefully check the shrimp to ensure that they are cooked through. It will take a little longer. Soften the vegetables and cook the shrimp in the skillet using the technique used for Shrimp Zoodles. Cook the couscous separately, adding all of the spices to the liquid. Combine all the ingredients at the end. And, if you happen to have any leftovers, be sure to freeze them! 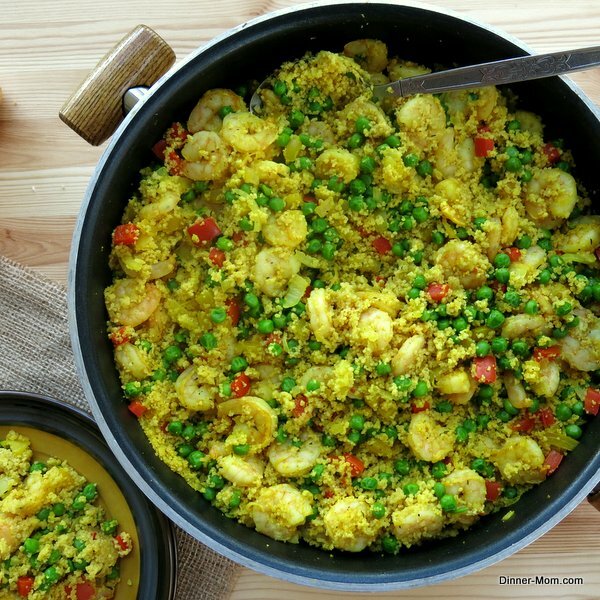 Shrimp Couscous Paella is a quick and easy one dish meal that's perfect for a busy weeknight and is fancy enough to serve to guests. 1/2 teaspoon Red Pepper Flakes if you want some extra heat! Add onion, peppers and garlic to pan and saute for about 5-8 minutes or until the vegetables are tender. Stir in remaining ingredients, except for couscous. Raise heat and bring mixture to a very low boil. Reduce to medium-low heat and simmer for 8-10 minutes until shrimp turn pink, stirring occasionally. Remove from heat and stir in uncooked couscous. Cover with lid or aluminum foil and let stand for 5 minutes. 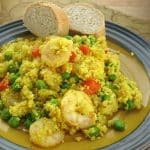 Paella is seriously one of my favorite foods ever, but I also looooove cous cous! This sounds so good! Thanks! I’m a big paella fan too…but this is soooo easy! This looks delicious. 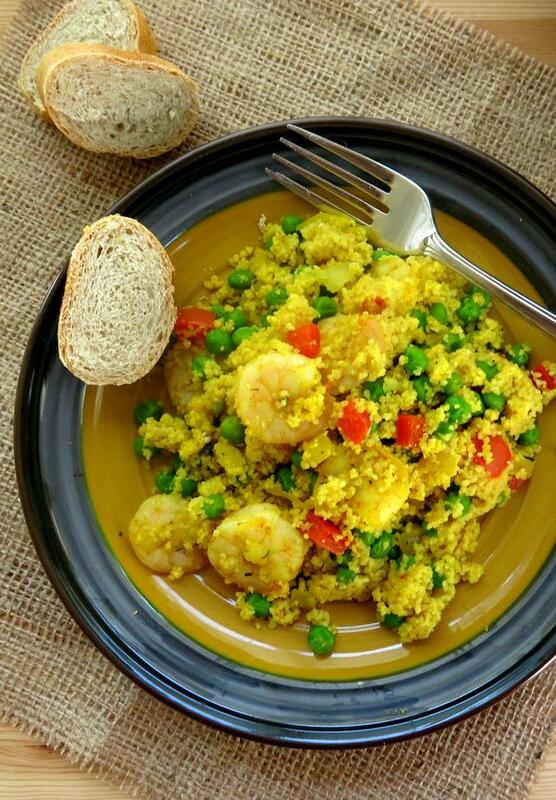 I love the switch to couscous….brilliant!! Just had paella for the first time at a restaurant, will have to try this myself! OMG! So smart to sub in the couscous to quicken this up. I am so going to try this. All the right flavors of paella in half the time! I didn’t have thyme, so I substituted cilantro. I didn’t have chicken broth, so I used 2 cups of vegetable broth (instead of broth and water). Finally, I only had precooked frozen shrimp. It was still delicious! I can imagine how much better it would’ve been with fresh shrimp. This is a keeper! I’m so glad you enjoyed it! As a certified cilantro fanatic, I will definitely trying that next time. Great idea!